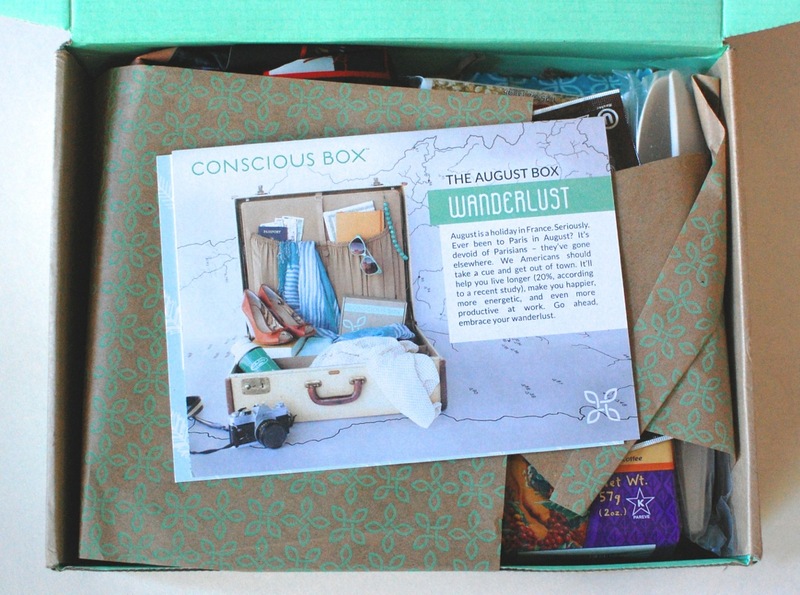 Conscious Box August 2014 Review & Code for FREE Box! 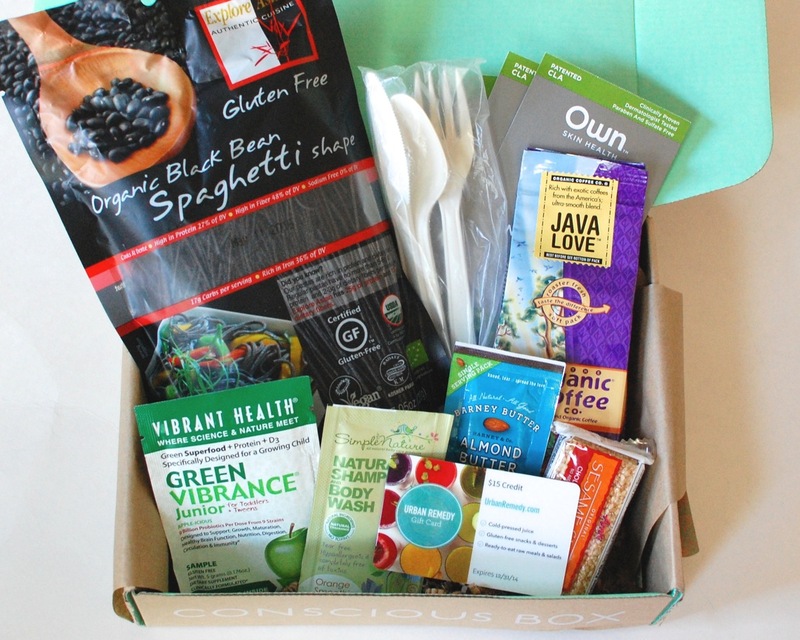 Conscious Box is a monthly subscription box that features eco-friendly/natural products. Items range from healthy snacks, to natural toothpaste, and everything in between. There are 3 different boxes to choose from: The Vegan Box (which I always get), The Gluten-Free Box, and the Classic Box. Along with the box type, there are also 2 box sizes to choose from: The Plus (as low as $16.95/mo) and the Taster (as low as $6.95/mo). I always get the vegan “Plus” box. Let’s see what was inside August’s (vegan) box! First look. This month’s theme is “Wanderlust”, though I can’t say too many of the products actually reflect that “theme”. Explore Asian Organic Black Bean Spaghetti – I actually got this in another subscription box a few weeks ago, but haven’t tried it yet. The only ingredients are black beans and water, so it’s a super healthy alternative to real pasta. I’m just not sure how to serve it. Bioderived Picnic Kits Utensils Set – These utensils are made from renewable resources and are biodegradable. They’re also freezer and microwave safe. Barney Butter Almond Butter – A little packet of gluten-free, peanut-free almond butter. I always use these for my smoothies. They’re a perfect portioned size. Amki Orginal Sesame Snaps – I’ve tried sesame bars(?) like this before and I’m not a fan. Just not my thing. Own Beauty Anti-Aging Trio – These are the dinkiest little samples ever. Each one is pretty much a dab of cream in a tiny foil packet. Meh. Simple Nature Natural Shampoo and Body Wash – An all natural shampoo & body wash that’s tear-free and safe for newborns. It’s naturally scented with orange essential oil and real vanilla extract. I just wish it were a larger sample. There were also a couple coupons, paper(?!) cut-out luggage tags, and a free sampler download of some recipes. I wasn’t too thrilled with this month’s box. I feel like because they included a full sized product (the pasta), they just threw in a bunch of other teeny samples (except the decent-sized coffee) and called it a full box. Not cool. Hopefully next month’s will be more impressive. Wanna try Conscious Box out for yourself? You’re in luck, cos right now you can get your First “Taster” box FREE (just pay shipping) when you click here and use the code “TFREE” at checkout. – OR – $10 OFF your first “Plus” box when you click here and use promo code “FBPLUS10OFF“. Awesome! I was pretty underwhelmed with this month 🙁 . The spaghetti wasn’t even in my box!